Yesterday, a low coming in from the eastern M.P. region moved in fast and poured heavy rain in scattered pockets all along the regions of M.P,Gujarat and Rajasthan. 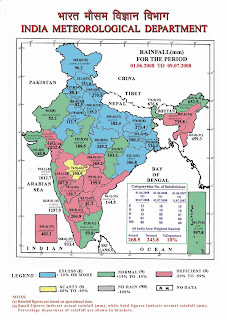 Regions of normally sparce rainfall like Jaipur, Chittorgarh and Jodhpur in Rajashtan got heavy rains from 90-220 mms. It has advanced the monsoon into the remaining parts of the country and moved the monsoon into east Pakistan region. The remains of the system may give some rain now to the sindh region, including Karachi. But, just as fast it came, the low is fizzling out in the deserts of west Rajasthan and Sindh. It has brought some relief to the regions going towards deficiency. The rain map on 9th. July shows the area south of M.P. as deficient, with a pocket in central Maharashtra as extremely deficient, and the western states as normal. The entire nort hern belt is excessive in rain. The rainfall pattern is moving towards a "north-south" divide. I quote from the latest report of the MF Global Weather Inc.
that were drier than usual in June will be dry again during july." This report needs a lot to think over and take effective remedial steps at this stage for crops, power and water planning, seciaqlly in Kerala,Maharashtra,Gujarat and Karnatak. The situation, as per almost all weather models show no signs of any low or system forming in the next week, that is upto 18th.July. 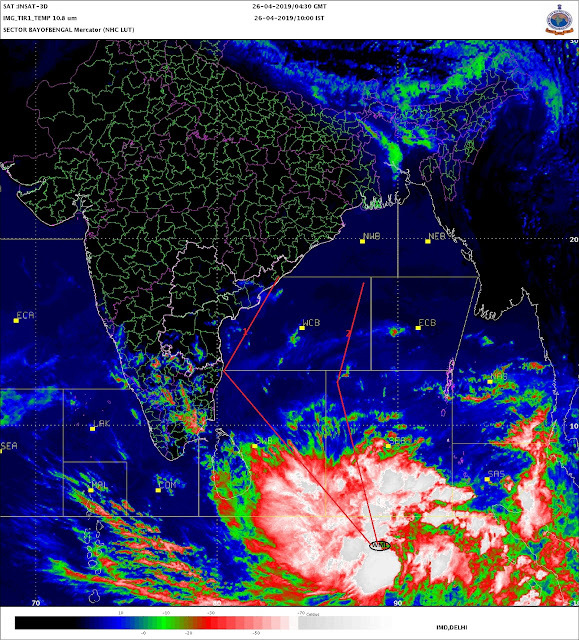 The monsoon rains in the next week will be confined to the northern/eastern states and coastal Orissa. Now, with the soil already saturated, the threat of flooding in these states will be more in July than June. Hence, I quote from the MF report in conclusion:"
downplaying rain potentials during the next two weeks. potential until a better period of rain evolves later this month." Thanks to Ashokbhai for sending the report. The "dry run" has continued here in Mahabaleshwar. The situation is very alarming as all the dams in our area are empty. This is likely to affect not only the farmers, but hydro electric generation from Koyna will also fall, upseting the economy of Maharashtra in general.